The 2nd annual Transform Conference is less than 90 days away and seating is already starting to become limited, have you secured your free tickets yet? If not, you're going to be missing out on a day filled with networking, education, and transformative speakers who will change the way that you perceive data collection. If you or your boss are still not sure about attending this year's event, we've highlighted a number of reasons why this is the year to attend Transform! Transform is an amazing experience because of both the type of speakers and attendees that show up. This is not your typical "8 hour, sit in your chair and listen" type of conference. Transform is a conference focused on you, THE USER. We have brought in speakers as well as developed topics that are aimed at making you more efficient. Our goal is that you leave the conference with dozens of new ideas on how you can implement and improve GoCanvas usage within your business! We also make our team available to you all day. If you have any lingering questions or topics that you'd like to discuss, just tap one of us on the shoulder and we'll be happy to walk through anything with you! 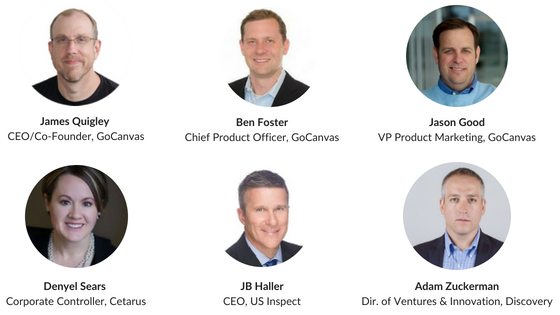 At Transform 2018, attendees will have the opportunity to hear from 8+ amazing presenters who will walk through exactly how subscribers can leverage new features of the GoCanvas platform to further increase their business' productivity and efficiency. The presenters will also focus on hot topics such as business intelligence, data reporting, backend integrations, and much more! This is a major part of the GoCanvas's roadmap and something that will be a focal discussion point at Transform 2018. I cannot understate the variety and amount of amazing presenters we have scheduled for Transform 2018. From Chief Executives and Chief Technical Officers to Corporate Controllers and Chief Product Officers, you'll be able to gain key insights from every essential department within an organization. This conference is built for every job type and industry, which is why we've invited speakers from four very distinct areas of expertise including Energy, Fire Safety, Utilities, and Field Services. I'm also personally excited about Transform 2018's keynote speaker, Adam Zuckerman. Adam is the Director of Ventures and Innovation at Discovery Inc. where he carries with him decades of experience in the technology sector. Over the years he has collaborated with the likes of Anheuser-Busch, Box.com, DocuSign, Facebook, Microsoft, NASA, and Twitter. We're excited for him to be a part of Transform 2018, and for him to be presenting on the very important topic of "The Impact of Artifical Intelligence on Business". Transform 2018 will be occurring around the biggest launch of the year, GoCanvas 10. We're super excited to unveil and walk through this release with you. I can't give too much away, but it will mark a major shift in how subscribers interact with the GoCanvas platform. It's definitely something you'll want to see in-person! In addition to the launch of GoCanvas 10, we will be laying out and reviewing with you our development roadmap for the rest of 2018 as well as 2019! This will give you insight into which features and functionality are on the horizon, and how you may be able to gain beta access to them. This is a very important part of the conference because we rarely pull back the curtain on what our development team is working on, so definitely try not to miss this! Are you ready to take your data collection to the next level? Want to see where the GoCanvas platform is going, and be on the ground floor of our latest big release? If you haven't registered yet, be sure to register now before space runs out!